I’m getting stuck putting an outfit together, and what it comes down to is the socks. I’m wearing a mid-grey worsted wool suit with a sky-blue shirt and regimental tie of burgundy and navy stripes. 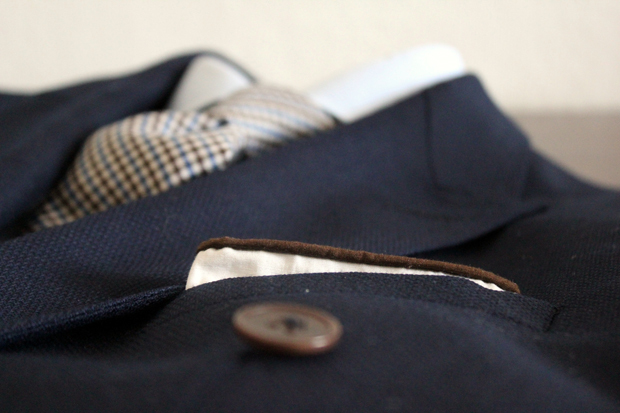 The hank/pocket square has a white ground with checks of light blue and wine. The shoes are brown. I feel if I keep to the grey of the pants for the sock choice, it will be too boring but if I wear socks that are burgundy it will look odd with brown shoes. Do I wear sky blue socks? I don’t seem to be arriving at a solution that seems to work well. That’s a very specific question. Let’s see if I can give you some general principles and work through those to get a specific answer. 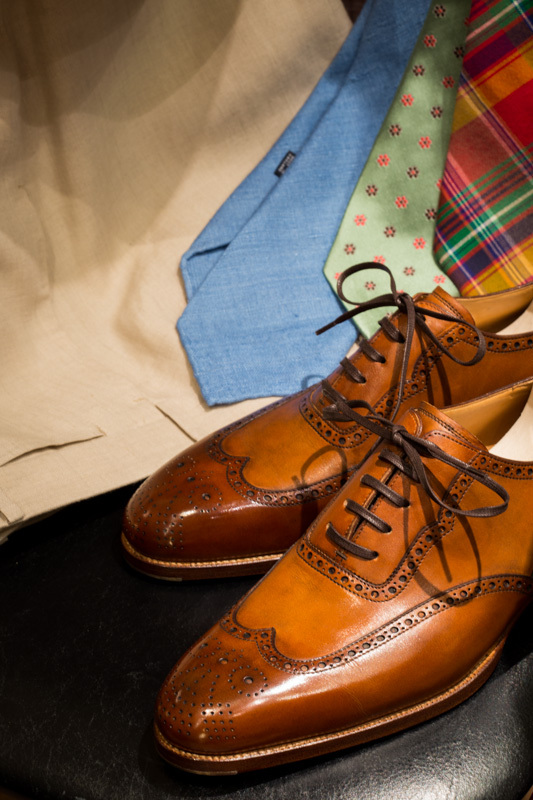 First, you’re thinking along the right lines in picking up a colour from above the waist with your choice of sock. Burgundy could work well, and there’s no reason it won’t go with your brown shoes, particularly if they are dark brown rather than tan. Burgundy is probably the second most-versatile sock colour after dark green (once you’ve ruled out anything that matches the trouser). Burgundy works best with navy, for me, but may still compliment your grey suit. Second, grey may not be that boring. It sounds like you’ve already got a lot going on up top, and adding burgundy socks may be a step too far. Coco Chanel had a line about looking in the mirror before you leave the house, and taking off one item. In your case, it may mean swapping the burgundy socks for grey. In fact, I would say that the most common error I find with readers I meet is that they try to hard. Dial down one item and the chances are you will be better dressed. The other risk with burgundy socks is that the outfit becomes too ‘matchy-matchy’, too obvious and thought-out. 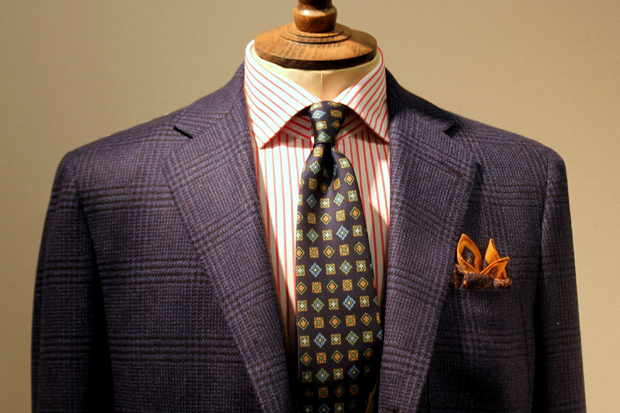 Matching a colour in your tie, shirt or handkerchief is a good place to start, but it’s not the only option. Colours should harmonise with each other, not copy each other. What do I mean by that? Well, think of another tie or handkerchief that would look good with the combination you described. Would dark green work, or burnt orange? Perhaps even a patterned brown (if different enough from the shoes)? The same colours that would be alternatives for the tie or handkerchief will also work for the socks. The reason it is a good idea to pick up a minor colour from something else you are wearing is that the designer has already picked that as harmonising with the major colours. He has decided that navy and burgundy are in harmony on your tie, and light blue and wine work like ebony and ivory on your hank. I hope that helps. If you want to put colours together in an outfit, look at how your favourite brands combine specific shades of colours in their ties, handkerchiefs and anything else. And I’d go with grey socks. You can follow the discussion on How to wear socks with a suit: Reader question by entering your email address in the box below. You will then receive an email every time a new comment is added. These will also contain a link to a page where you can stop the alerts, and remove all of your related data from the site. Thanks so much for taking the time to answer my question. Your advice is quite sound as I do have a tendency to overthink and as a result add more colour than I should. Great comment Simon: “Coco Chanel had a line about looking in the mirror before you leave the house, and taking off one item.” I totally agree. Many times less can in fact be more, something I often make an effort to apply to my set of options. P.S. I don’t regard photo number three as too matchy-matchy. I think it has a quite pleasing color scheme. We’ve all met someone who was trying too hard to show off his intelligence, or his wealth. We’re put off when someone is too aggressive in demanding our attention and admiration. Often we make a better impression when we’re more subdued. Then others don’t feel as though we’re forcing them to look at and praise us. Just as we shouldn’t trot out every book or equation we know, but let the quality of our mind show in our work and calm good sense, we should dress with subtle elegance. Simon I’m in desperate need of your help! I’m looking for either of 2 types of Tuxedos. 1. Midnight blue with the horseshoe waistcoat. Thanks Simon. Do you know roughly how much a Thom Sweeney 3 piece dinner suit is? sorry for costing questions. What do you think about having a peak lapel v shape waistcoat with a peak lapel tuxedo? too much? What’s your opinion on loud socks (however you define them)? In plain colours, or subtle designs, they can be a nice addition to an outfit. Bright red with navy, for instance, or purple. Yellow and orange work well with tweed, brown moleskin etc, and anything country-like. Now I chatted with MannyJ a guy who’s in the know for it I admire him as will I you should you offer up the gold dust info I require about socks grey Argyll socks grey with light blue polka dots I havnt the bit of understanding how grey comes into it as the book I have at home on men’s style says match socks with trousers or a shade darker so how does grey work with the get up I have? Any thoughts on that one? Would be much appreciated, as always. Thanks for your time, and your great site! I think I’d pair or match socks to different elements depending on my mood and creativity of the moment. Trousers when I want a safe and dark color, shoes for a different effect, especially with brown loafers, ties or the shirt when I want a lighter color. Thanks. Yeah, I sometimes match the trousers, I’m not very tall, but being of slim structure, including my ankles, I feel like I can go creative and pair many different colors, modarately contrasting or brighter, as long as they matched a part of the outfit. Besides I’ve seen many people matching the socks and I thought it was a classic, never felt they made them shorter, as there is still a continuity, albeit a different one :). Sorry for the later reply, if you don’t mind. Hi Simon! As you have commissioned many trousers in the last few years (either with suits or separately), I have noticed in the latest posts, that you match your socks mostly with your trousers (there have been posts on using specific colours like green or red), therefore my question would be, if this is the main guideline (match the colour of trousers and socks) and whats your approach of buying socks when you order new trousers? I know, this is a small detail, but it would be great to know something to automate the process a bit for my daily routine. thanks! Yes, the default is match socks to trousers. The idea behind it is to lengthen the appearance of the legs. I usually wear knee high socks with my suits. Nothing worse than having a hairy leg peaking through. However, one thing that usually annoys me is that my trouser get stuck in the socks. After sitting down I usually have to adjust/pull down my trousers again as the socks are holding up the trouser from uncreasing. Wider trousers would be an obvious solution, although I have the feeling mine are fairly wide already. What sort of fabric do your socks usually have? Would maybe a portion of silk help to reduce friction? Or a smoother inlay in the inner part of the trouser? Thanks a lot for even attending questions from your older articles. Silk won’t help much – I have cotton most of the time and thats as good as anything. Wool is worse. Having the trousers lined to the bottom works, but is hot and sometimes equally annoying.